Home › News › Our sixth newsletter is online!! Find out about the flood pilot organised last month in Vicenza where we tested, through a flood scenario that recaptured the real-time events of the Vicenza floods in 2010, the second prototype of our platform! 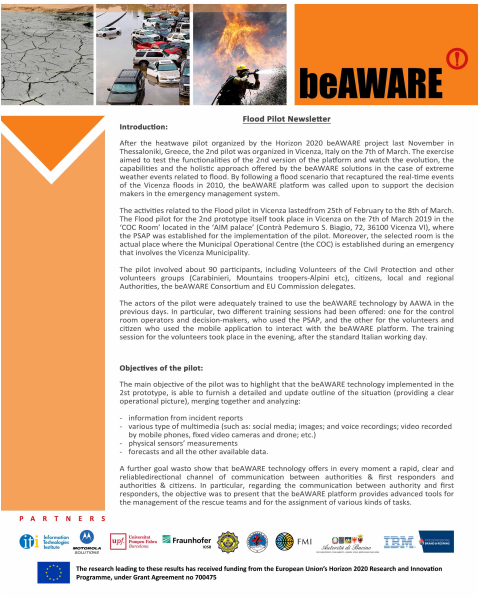 A big thank you to our partner AAWA for the orchestration and the hospitality, all the Italian civil protection organisations that took part and of course the entire beAWARE consortium for their endless efforts to improve the solutions offered by the beAWARE project!